I've tried watching Apocalypse Now a few times and only ever made it through once or twice. Like Full Metal Jacket, it starts of incredibly strong but as it goes on it gets more and more painful until the three hour mark where you are pretty sure if you continue, you will end up naked in a hotel room doing tai-chi and punching mirrors. 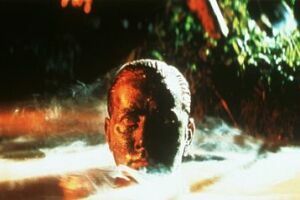 Apocalypse Now is probably one of the most monumental films in US history, but the entertainment value drops significantly after the first hour. There is a lot of history about Apocalypse Now that I know little about. Something about Martin Sheen plays the role of the psychotic CIA assassin pretty damn well. He's a weapon that gets rusty if left out in the World too long, so he accepts an insane job in an insane world simply because he has no other choice. Along the way he sees and seems to understand the upside down world of the Nam where beaches are taken for the way the water breaks and a puppy gets a fisherman family killed. There is no doubt that Apocalypse Now is a great film, but is it entertaining? Once we leave the great personality of Leutenant Colonel Kilgore (Robert Duval's greatest role) the movie begins to turn down hill. We get more and more into the psychosis of the world around our merry band and less actually happens. It's a two hour boat ride down the river of horrors. The new "Redux" of the film has a few added scenes including a run-in with some stray playmates and a meeting of communist French colonists. The final confrontation between our hero and his target seems to be an eternity of torture and philosophy until the conclusion takes the only path left to take. The DVD contains a wonderful conversion of the original film with a 1.85 to 1 16x9 enhanced picture and a Dolby Digital 5.1 soundtrack. The remaster is very well arranged, never making it too clear that it is a revision, not the original film. There is no DTS soundtrack and no commentary track. A commentary for a movie of this magnitude would have added a lot to this film, even if it was a historian, critic or the grip. I guess it leaves room for another version to come out. Apocalypse Now certainly doesn't fall into the "mindless entertainment" category. It is a film for film buffs, probably not for the typical "Pearl Harbor" audience we seem to be raising. It is a movie about war, it is a movie about focus in chaos, it is a movie about movies. This DVD version is the best version there is.